Drawing a single card from the deck does not constitute an actual spread, however it is the easiest and perhaps the most common method of reading used. Since it is not involved in the kind of storyline that a spread presents, there are no cards to compare and contrast. The reader simply interprets the card as the answer to his or her question. This simple 3-card spread is read like a chronological story. The positions are apparent, and there's not much need to give instructions based on the simplicity of this spread. One of the most commonly known spreads, if it didn't already exist in every book and tarot reading website there is, probably everybody that ever used tarot cards would have invented it themselves. With the Cross spread, we suddenly realize how quickly the scenery changes with the addition of a single card. Everything seemed so innocent in the easy 1 and 3 card spreads. It was sunshine and lollipops until they threw in a fourth card and decided to blaspheme the holy ghost by using the symbol to call upon the devil. They use the devil's cards to get advice from unholy spirits using the sign of the crucifix. The first card is known as the significator, or the card that defines the background of the question and the whole spread. 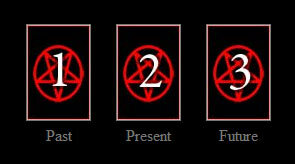 Tarot spreads above 3 cards generally all have a card, at least one card, as the significator. The significator sets the tone for the whole tarot reading. 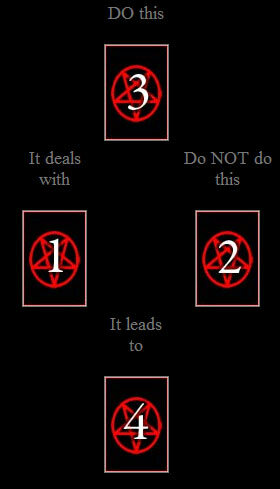 The second card is supposed to be an image that represents what the devil is telling you not to do. According to the cards, this idea should be avoided. The third card has the image of the devil's advice. If you follow his advice, his promise is that the result will be what you see in the last card, #4. The devil offers relationship advice like a matchmaker of lust. This Relationship spread attempts to break down the realtionship between 2 people using a scientific method of psychology. It is interpreted by analyzing the differences between the matching cards on either side of the relationship. The first card to be seen is the significator. This card represents the overall theme and mood of the entire relationship. Next we move to interpreting the 2 columns that characterize each individual's role in the pair. The top row shows the conscious thoughts of each person, or what they think about the relationship and their partner. The middle row, cards #6-3 show the way each individual feels about the other. The bottom row represents the way each person acts in the relationship. The stance they take could be genuine, or maybe it is just a facade. This spread is the devil's word. He tricks us with cute good luck symbols which are in reality just godless attempts to manufacture one's own luck with the aid of superstitious heretical nonsense. The Horse Shoe is a more in-depth spread than the 3 card version of the Past, Present, and Future, adding 4 extra cards to form the shape of an horse shoe. Essentially the spread works the same way though. Cards #1, 2, and 7 show the chronological past, present, and future as it plays out. In this spread, card #3 hints at the evil occult influences that are allegedly haunting your path forward. This card is a warning and could signify the devil or demon that is on your back. The top card, the Obstacle is read in conjunction with card #3 to help determine who or what the enemy is. This is the card that shows what stands is your way, what must be overcome. 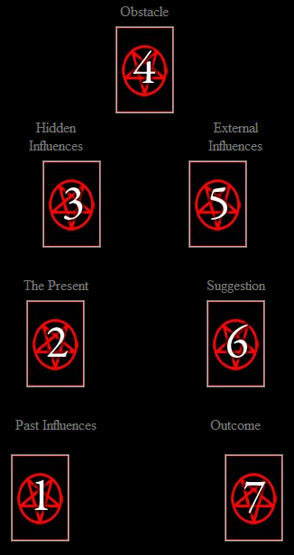 The next card, #5 should also be added to the mix of the 2 prior cards in the interpretation of who the enemy is. This card has more to do with the environment and who is there watching your struggle. It may be a friend, or possibly an enemy. Next card #6 comes along to conveniently suggest the course of action. The number 6 is the number of man, but also the number of evil. Naturally the devil knows what lies in the vile heart of man. Probably the most famous tarot spread is known as the Celtic Cross. The heathen idol mocks the Christian version by using a very close symbol to invoke Satanic visions. The spread is much more advanced than the 3 card Past, Present, and Future spread, looking into deeper forbidden zones such as the rational and emotional psychological basis and the reader's secret hopes and fears. One begins using this infamous spread by looking at the significator, saying "this is it." The second card is laid cross-wise over the card, not quite like the picture which is altered for online convenience. The second card "crosses" the first, meaning this image compounds the significator. 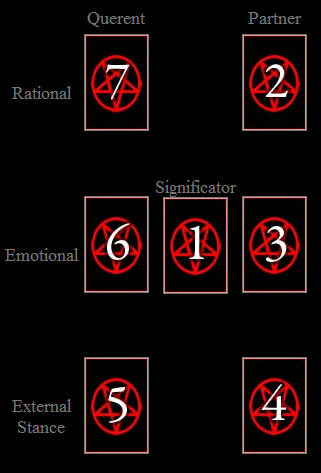 The crowning card above the cross, #3 shows the rational thoughts, while #4 below shows the emotional feelings associated with the issue. Cards #5 and 6 represent the timeline just like the 3 card PPF's past and future cards. Card #7 shows the asker about their own attitude, while #8 is concerned with the mood of the people and surroundings effecting the situation. Card #9 shows either what the asker is afraid of or secretly hopes for. The final card, #10 shows where the situation leads, the final result. Like the Celtic Cross, here we have another evil pagan imitation of the crucifix mocking the holy alter. The ankh is like the Egyptian version of the cross, and likewise the Ankh spread is shaped in its form. The spread is also similar in working, except this spread goes deeper into the background of the question. This spread has not 1, but 2 significators, the 2 crossing cards, #1 and 2. They are equally relevant. Going into the background is what this spread is meant to do, so the next 2 cards show the early causes of the situation followed by the triggering causes, the evil force that activated the dormant seed of the early causes. Higher perceptions, card #5 is actually supposed to represent what the LORD thinks about it all. This would be the card that really matters. Card #6 represents the concusion of the matter as far as what must take place according to divine fate. The bottom pillar further exposes the outcome, but from the lower perspectives rather than the high above. The future is broken into 3 steps. The immediate future is card #7, the next step that is supposed to be right around the corner. Then card #8 shows the image of a surprising experience that comes after. The final card, as always shows the final outcome of the matter, in other words ultimate fate. But keep in mind that if you believe any of this stuff you are worshiping heathen idols. Similar in form to the Ankh, the final spread on the site is just what you are looking for, the Secret. Everybody who plays with tarot cards attempting to summon demons is looking for secrets. Of course they only desire this evil occult knowledge in order to 1-up their brothers. They do not love their brothers as themselves, or they would share the knowledge instead of use it to try to make people feel stupid. Oh the ignorance of their folly! Like the Ankh spread, the Secret begins with 2 significators. In this case they are read as if they were crossed like in the Celtic Cross. Then above there are 3 chronological cards representing the past, present, and future. They are mystically labeled like the changing moon cycles, as the Secret comes from a dark place. Cards #6 and 7 are labeled Dark and Light, Dark meaning the dark or emotional side of the issue, and Light conversely meaning the rational side of things. There is not really a final outcome, but there are 2 future cards to show the reader's dark fate, the "Waxing" card #4 already mentioned and the "Next Step" at the base of the spread. This is basically the outcome. The final card, #9 is only considered part of the reading if it happens to be a Major Arcana card. Any Minor Arcana cards in this position only say that you didn't get a "Secret" this time. Maybe next time the devil's high priestess will be more generous.